Whether you DJ with CDs or a computer, the American Audio Radius 1000 will help you achieve the next level! The Radius 1000 is a professional CD/MP3 player with Midi capabilities so DJs can control their favorite music playback software. It features a large 6-inch (150mm) Jog wheel, 9 on-board DSP effects, and a large, bright display that shows track titles and artist ID tags. Radius 1000 has a red LED visual marker display that rotates around the jog wheel to show the reference point of where the CD/MP3 disc is playing. The Radius 1000 also offers features only found on the highest quality CD Players, such as: Slot-In CD Drive, Quick MP3/CD disc recognition, Advanced Track Search (search for a new track while one is playing), 10 seconds of Anti-shock memory, Seam-less Loop, 3 Flash Start buttons, Digital BPM Counter, and Digital Output (S/PDIF). Considering purchasing the American Audio Radius 1000 MP3 CD USB Player Controller? Have questions? Ask people who've recently bought one. Do you own the American Audio Radius 1000 MP3 CD USB Player Controller? Why not write a review based on your experience with it. 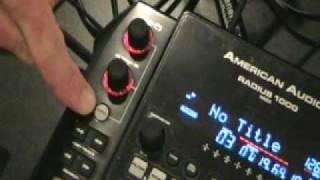 Seen a video for American Audio Radius 1000 MP3 CD USB Player Controller online or have you own video? You will earn 1,356 loyalty points with this product worth £3.39, when logged in. 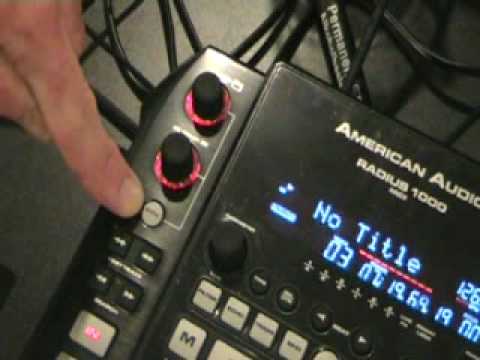 Check out American Audio Radius 1000 MP3 CD USB Player Controller on DJkit.com!